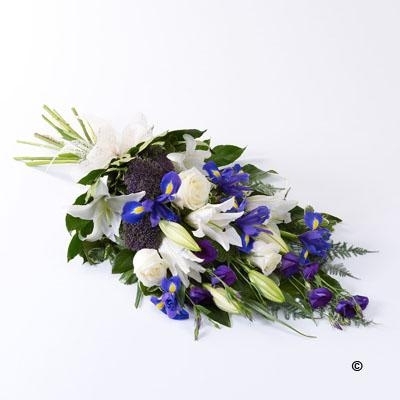 The soft blue shades of iris are complemented by white oriental lilies, white large-headed roses and blue lisianthus in this classic sheaf, which is tied together white cream ribbon. 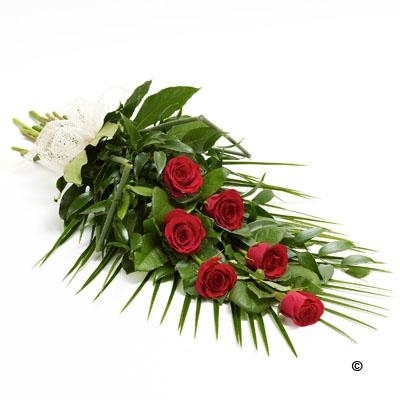 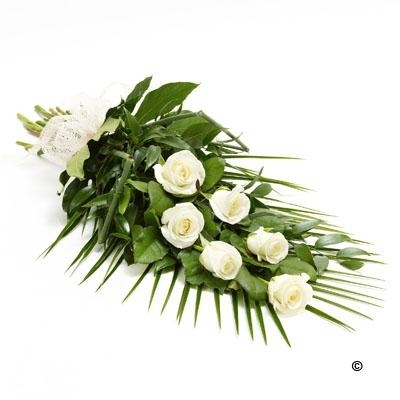 6 large-headed roses are presented with Aralia leaves, French ruscus and eucalyptus to create this simple, classic sheaf. 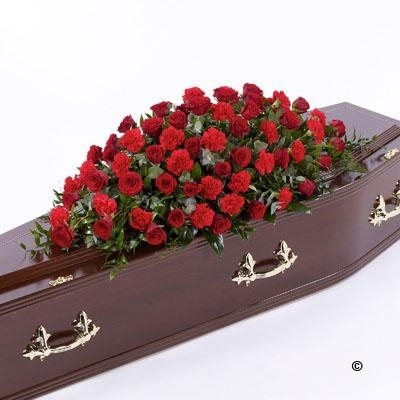 Also available in red, pink, and white. 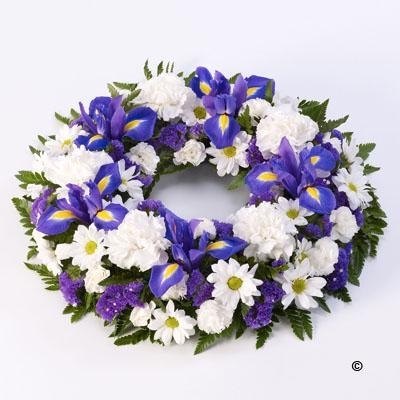 A classic selection of flowers including Iris, Carnations and Spray Chrysanthemums in blues and whites are nestled into this traditional circular wreath. 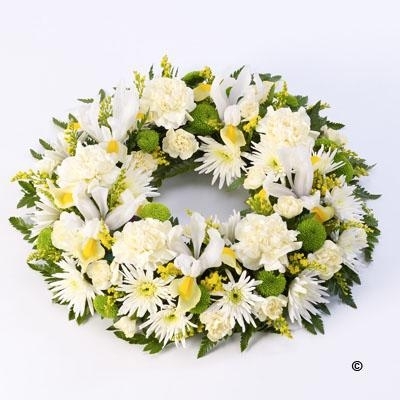 A classic selection of flowers including irises, carnations and spray chrysanthemums in yellow and cream are nestled into this traditional circular wreath. 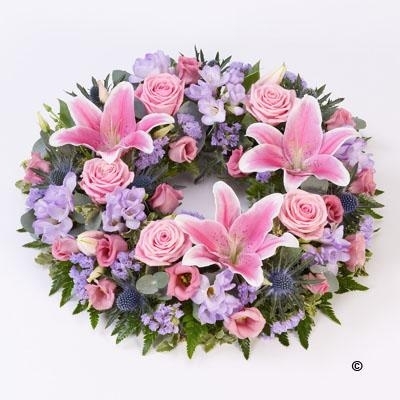 Pink lilies and large-headed roses are nestled amongst freesia and lisianthus in lilac along with blue eynigium thistles and foliage in this circular wreath. 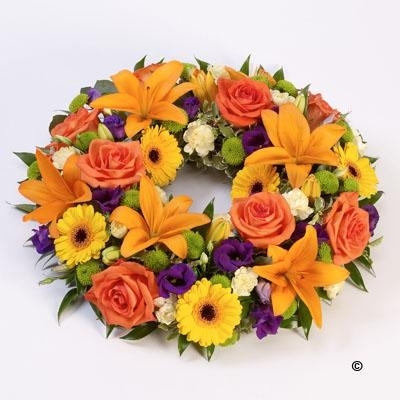 Orange lilies and large-headed roses are nestled amongst yellow germini, green spray chrysanthemums and purple lisianthus in this vibrant and striking circular wreath. 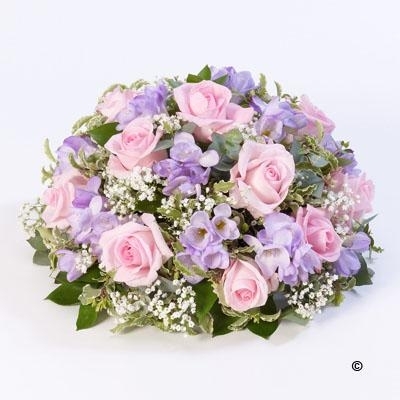 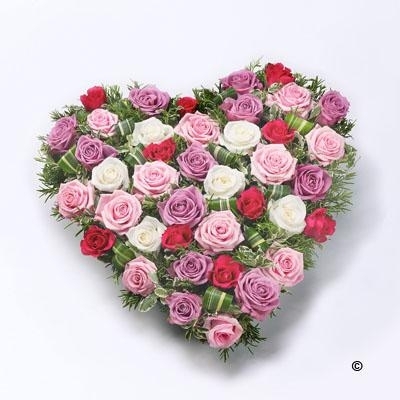 Small and large headed roses and spray roses in lilac, cream, cerise and pale pink are nestled into a solid heart shape finished off with Draconia leaves and scented rosemary sprigs. 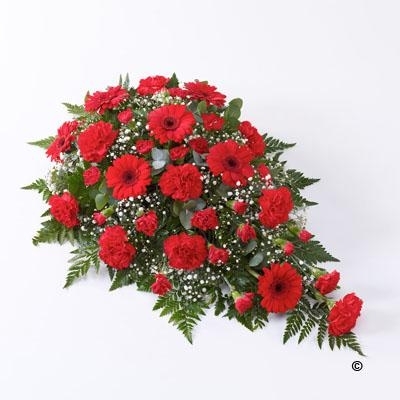 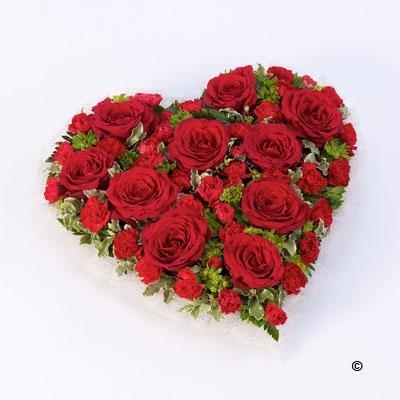 A traditional heart shaped design including roses and spray carnations in rich red complimented by choice foliage. 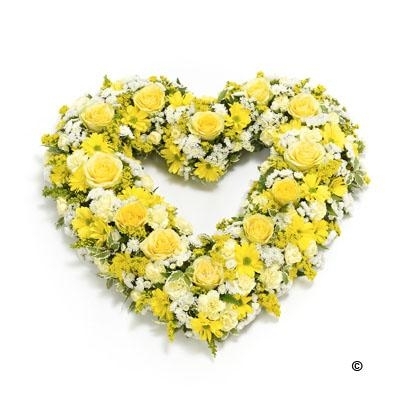 This open heart tribute is a sea of lemon yellows and gold contrasted with cream and white shades. 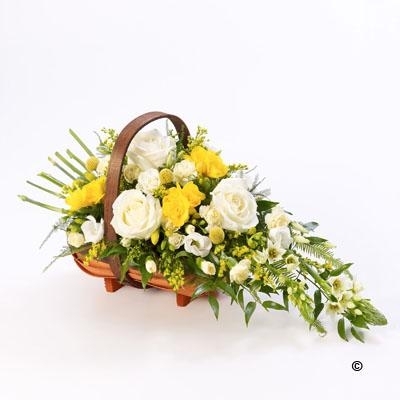 The arrangement includes fresh yellow roses, spray carnations and statice with solidago, pittosporum and leather leaf. 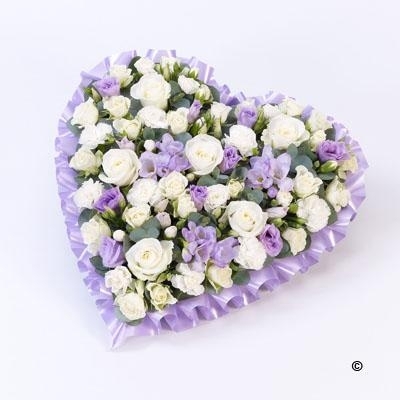 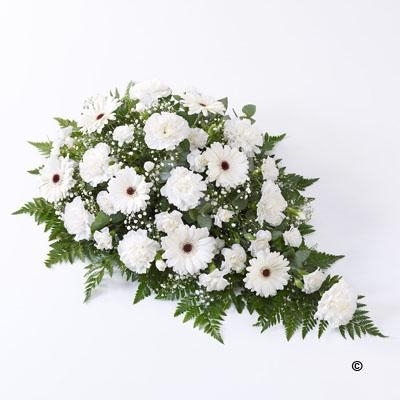 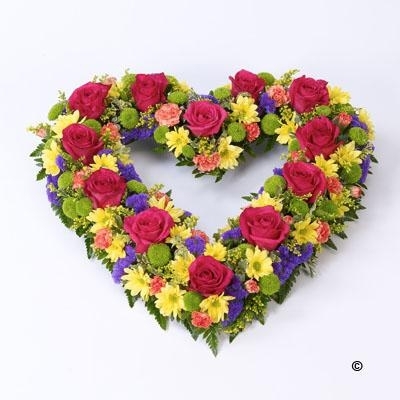 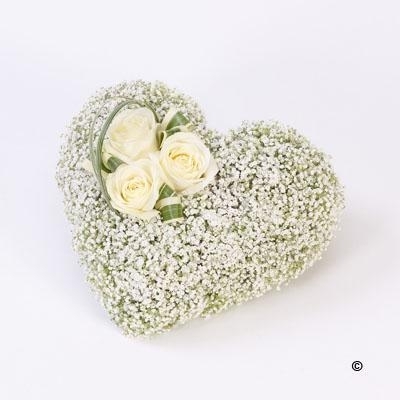 The perfect tribute for a loved one, this open heart shaped display includes fresh flowers in contrasting colours. 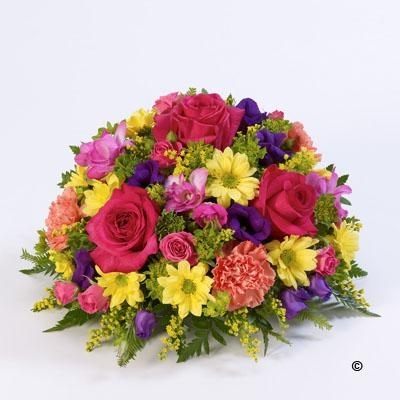 We've included cerise roses, golden yellow chrysanthemums, orange spray carnations and lime green chrysanthemums. 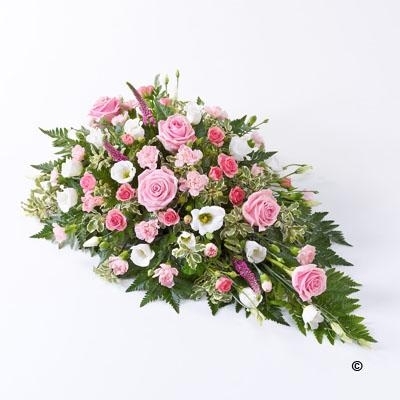 Roses and scented Freesia in soft pink and lilac are nestled amongst luxurious foliage in this classic posy design. 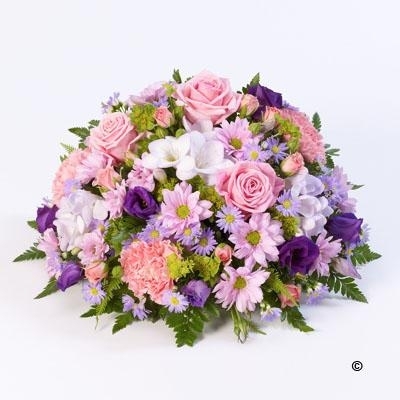 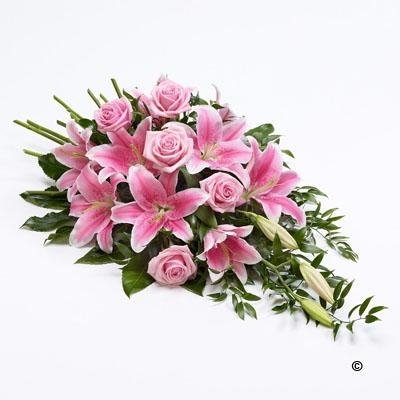 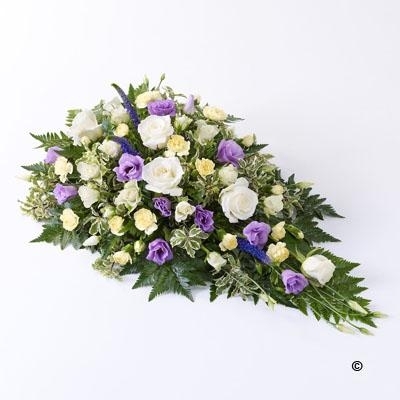 A classic selection in lilac and pink including large-headed roses, freesia, lisianthus and spray chrysanthemums presented in a posy design. 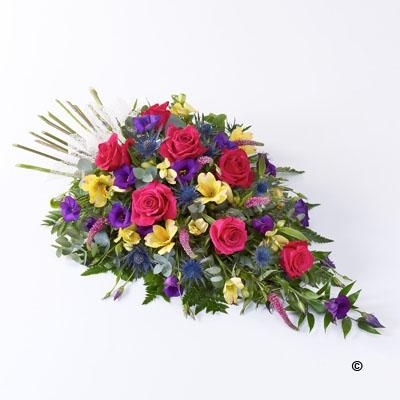 A classic selection in vibrant shades including large-headed roses, freesia, lisianthus and spray chrysanthemums presented in a posy design. 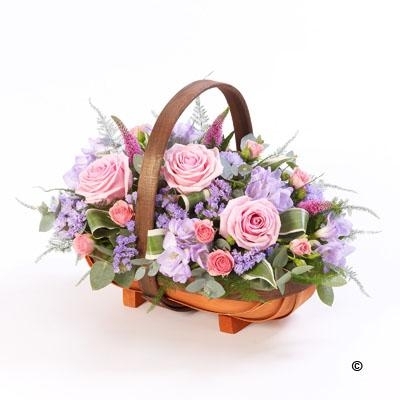 *Can be designed in any colouring. 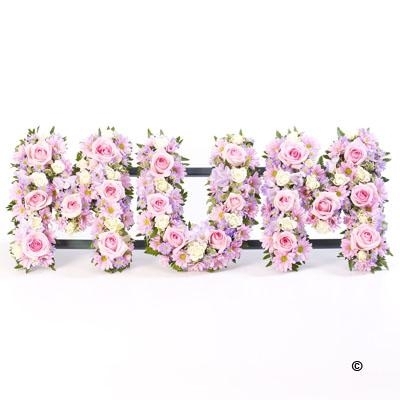 **Can be formed into any word up to 6 letters long. 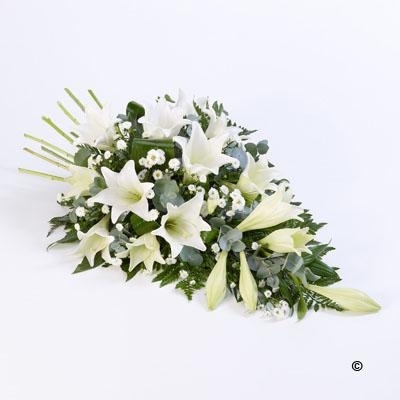 Classic white Longi Lilies are beautifully complimented by white Larkspur, Bupleurum and luxury foliages to create this elegant spray. 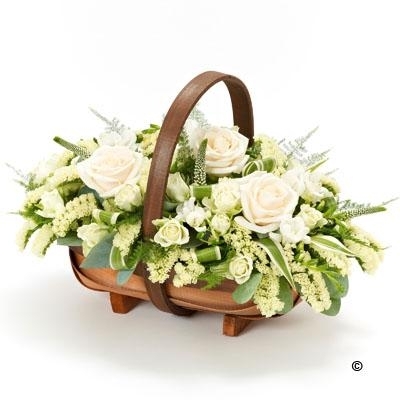 A traditional trug basket filled with roses, veronica, statice and scented freesia in fresh white and green. 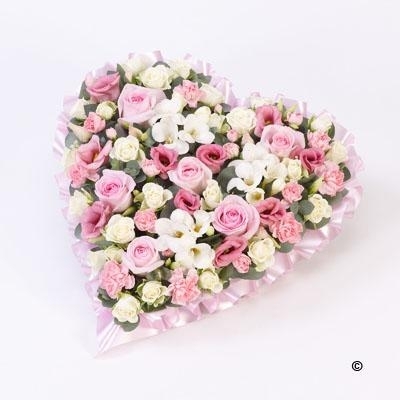 A heart-shaped design in soft pastel pink and white shades including large-headed Roses, Spray Roses, Lisianthus, Spray Carnations and scented freesia. 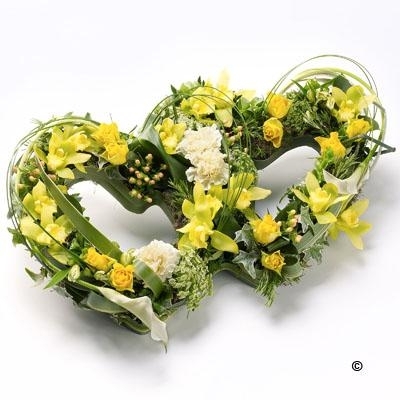 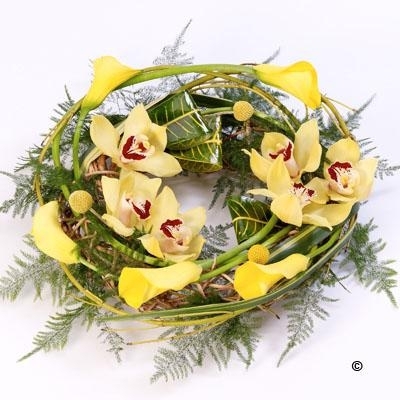 Yellow calla and cymbidium orchids are entwined with cornus stems, craspedia and asparagus fern around a circular willow frame to create this stunning woodland wreath. 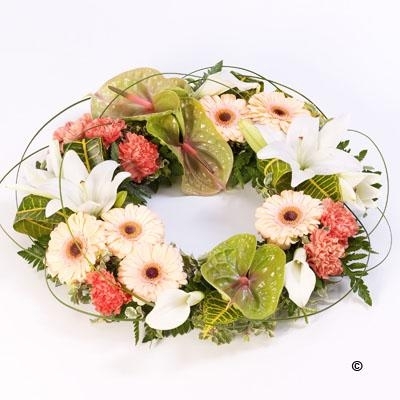 An elegant wreath featuring an exotic mix of anthuriums, calla, gerbera, lilies and carnations in green, orange and white. 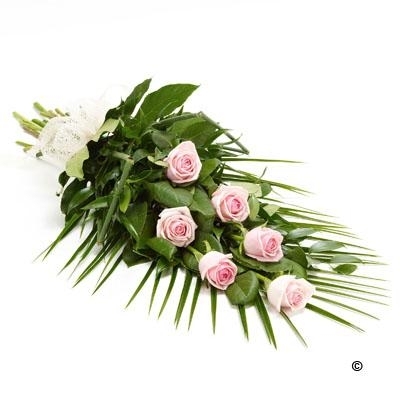 Tropical foliage and looped steel grass give it a contemporary feel. 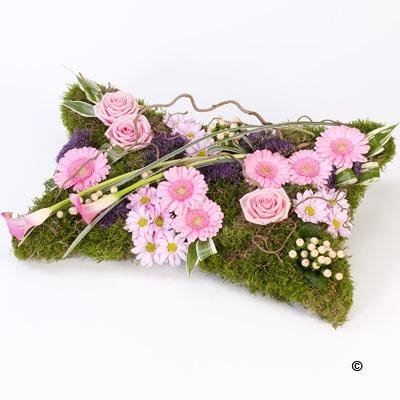 This pillow shaped design was a woodland theme and includes pink large-headed roses, germini and spray chrysanthemums along with calla lilies and twisted hazel amongst an array of greenery. 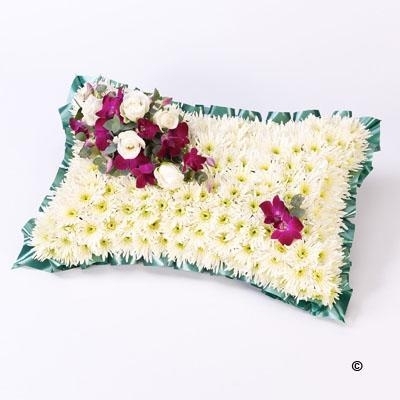 A classic pillow shaped design created using a mass of white double spray chrysanthemums and finished with a spray of white large-headed roses and purple dendrobium orchids. 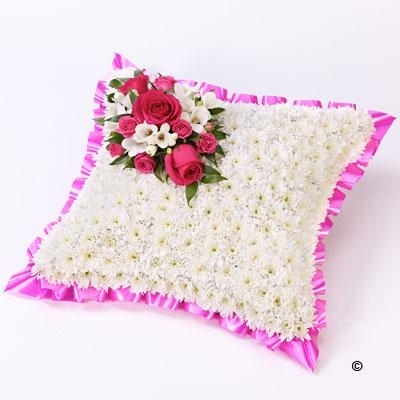 A classic cushion shaped design created using a mass of white double spray chrysanthemums and finish with a spray of cerise roses and white freesia and a pink ribbon trim. 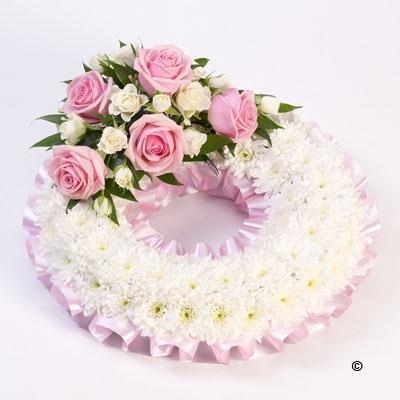 A classic circular wreath covered with a mass of white double spray chrysanthemums and finished with a pink and white spray of large headed roses and white spray roses and pink ribbon trim. 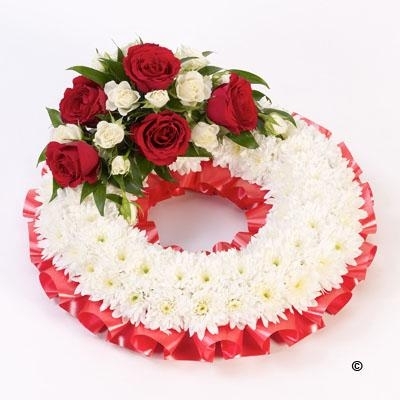 A classic circular wreath covered with a mass of white double spray chrysanthemums and finished with a red and white spray of roses and spray roses with a red ribbon trim. 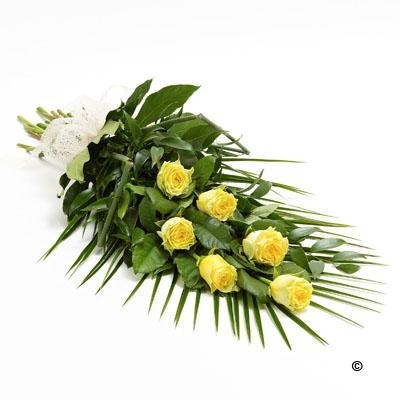 Also available in white, yellow and red. 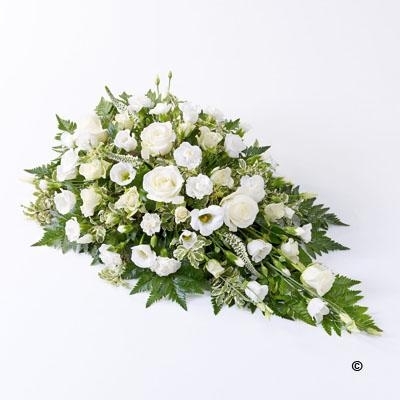 Mini cymbidium orchids, carnations, alstromeria, calla lilies and roses in lemons, creams and greens are nestled into two open heart shapes. 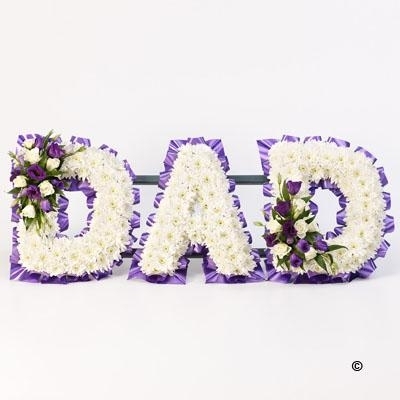 Also available in pink, cream, red, orange and lilac. 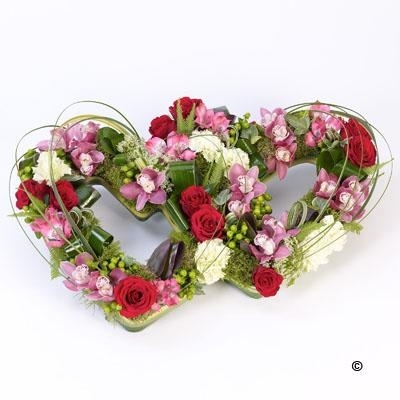 Mini cymbidium orchids, carnations, alstromeria, short-stemmed roses and hypericum in coordinating shades of pink, red, cream and green are nestled into two open heart shapes. 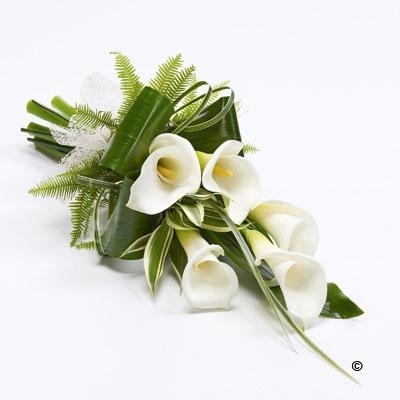 Loops of steel grass complete the elegant design. 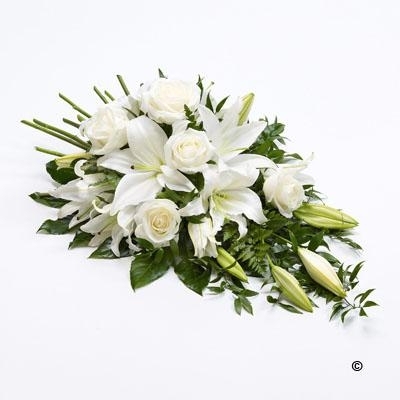 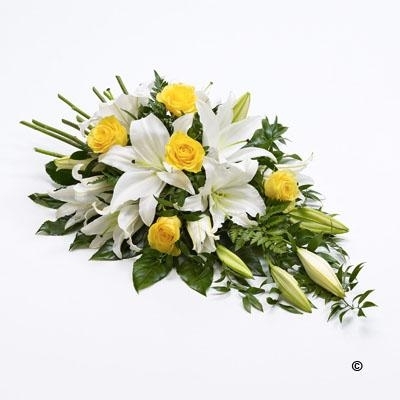 Aralia leaves and French ruscus are nestled amongst classic white oriental lilies and yellow large-headed roses in this classic teardrop spray. 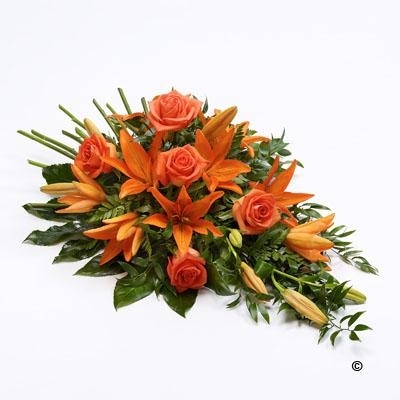 Also available in white, orange and pink.. 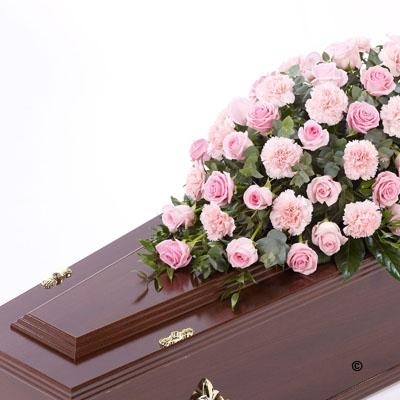 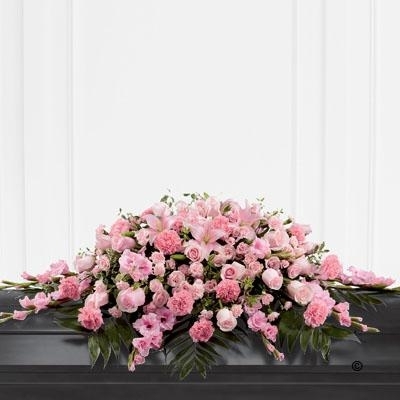 This beautiful casket spray features blushing pink roses, spray roses, carnations, gladioli, spray carnations and asiatic lilies, all elegantly arranged amongst an assortment of lush greens to create a very stylish display. 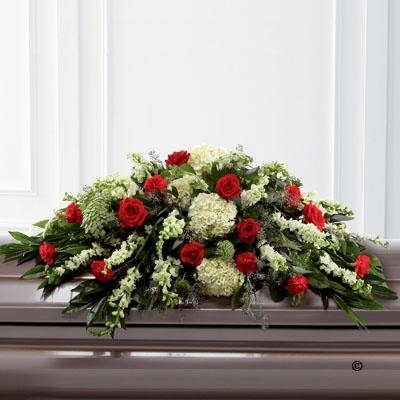 Rich red roses and carnations are an eye catching addition to a bed of white hydrangea, larkspur, anthirium, Queen Anne's lace and choice foliage to create a beautiful casket spray. 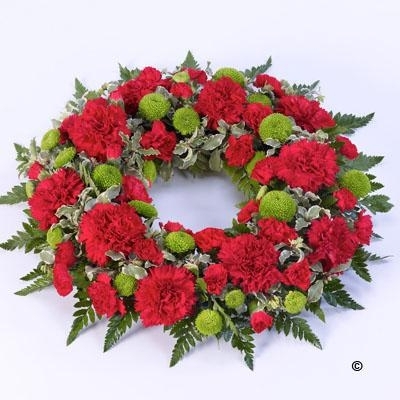 Large-headed red roses combined with red carnations and luxurious foliage create this traditional casket spray. 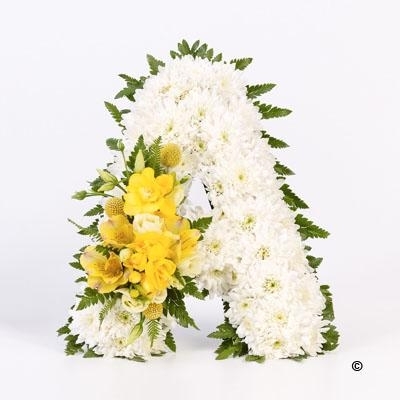 Also available in pink, white and yellow. 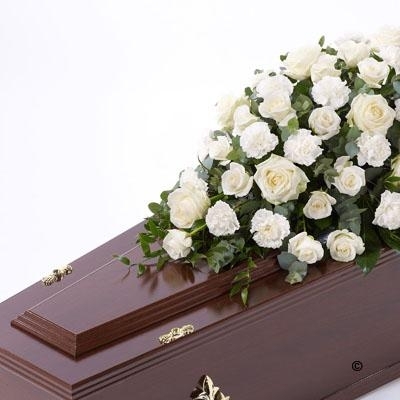 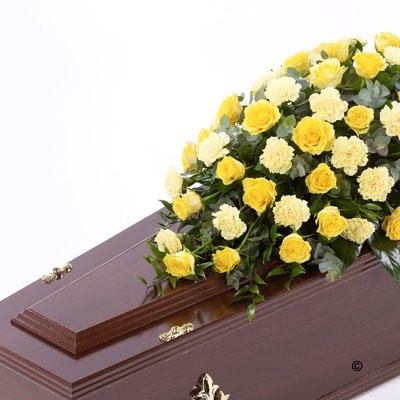 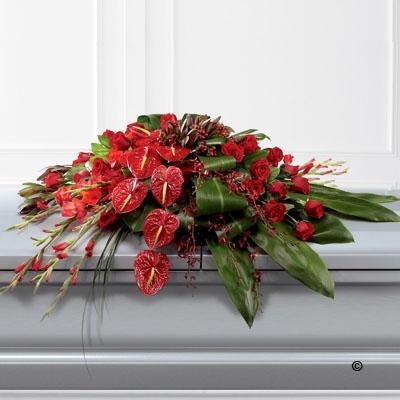 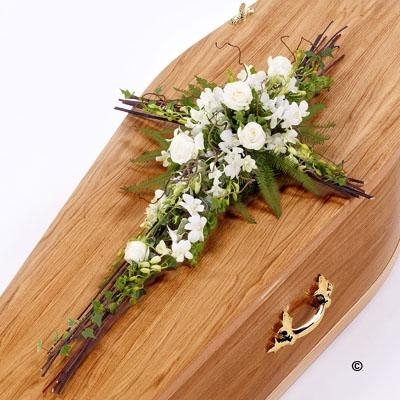 A very distinctive casket spray in shades of rich reds including roses, carnations, gladioli, anthuriums and orchids along with red hypericum berries, leucadendron and aspidistra leaves. 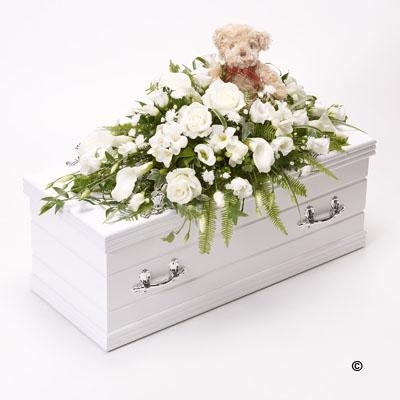 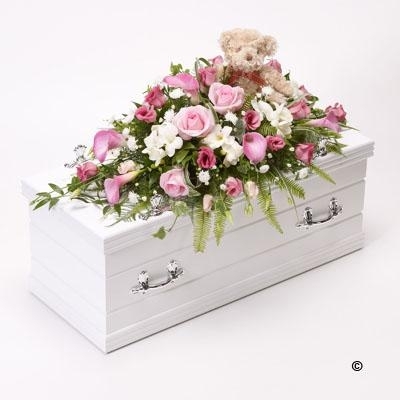 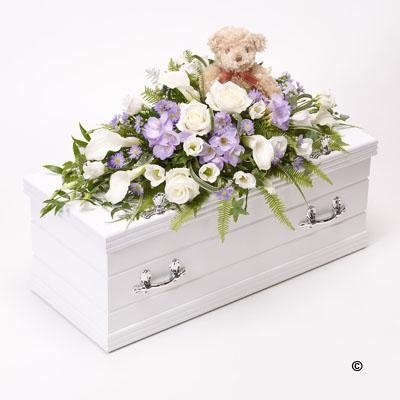 A sweet teddy bear is the focal point of this child's floral casket spray arrangement. 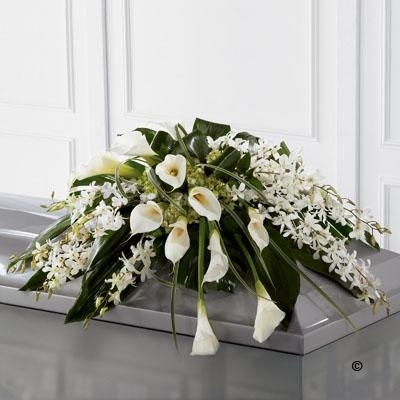 The fresh flower spray includes white calla lilies and classic large-headed roses, lilac freesia, September flowers and purple lisianthus. 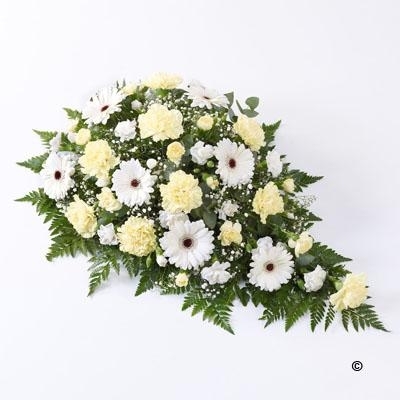 The display is trimmed with China grass, ruscus, asparagus fern and ivy trails.